Carpal tunnel gloves also popularly known as computer or arthritis gloves serve the purpose of preventing pain caused mainly by repetitive motion injuries. 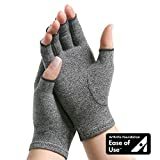 These gloves help deal with carpal tunnel syndrome which is a condition that arises when the median nerve compresses as it makes its way through the wrist at the carpal tunnel. In many cases, wearing some of the best carpal tunnel gloves can stop the condition from worsening. How Can Carpal Tunnel Gloves Help? Computer gloves are suitable for people who use a laptop frequently and make sure that the wrists and hands remain protected. These gloves make sure that the wrists remain in an ergonomic position. 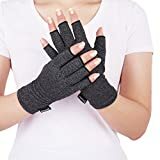 The heat retained in the gloves provides relief to joints and muscles that ache, however, most gloves will have latex so if you are allergic you need to be careful. Carpal tunnel gloves are of different types and most customers aren’t even aware of their existence. Instead of opting for a less complicated relief tool, people turn to complicated medical treatments that are pricey and painful. Carpal tunnel gloves are developed by doctors themselves after taking into account the various aspects of carpal tunnel syndrome. If worn throughout the day these gloves can aid in natural healing while improving circulation at the same time. Hand and wrist pain is often taken for granted though proper attention should be paid to make sure that no serious condition arises. These gloves can be used by everyone and aim to alleviate pain by providing relaxation. Without proper knowledge, many people end up buying products that can mess up the condition even more. That’s why it is a good idea to do some research is done before investing in a treatment plan. You may find that the most popular carpal tunnel gloves offering compression therapy will work well for your hands. However, it is equally important to give your busy hands a rest between repetitive tasks for maximum comfort and relief. Some of the best carpal tunnel gloves can help fight symptoms such as cold fingers that are a result of poor blood circulation. They help conserve body heat by keeping your hands and wrists warm and improving overall circulation. There are some parts of the body that remain neglected such as ligaments and tendons as they are unable to receive the required blood flow. 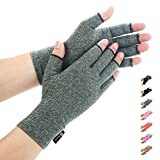 When you use a pair of quality carpal tunnel gloves, they help by providing the necessary warmth and improving circulation in the affected areas. Though heat packs exist, they can be difficult to handle. Carpal tunnel gloves serve the same purpose but are less messy to use and are easy to wear. They allow you to retain natural warmth, unlike heat packs. While carpal tunnel gloves can be very soothing to wear, there are a few drawbacks. For instance, if worn too tight these gloves can get really uncomfortable and can, in fact, stop blood circulation. Make sure to keep these gloves loose to prevent restriction of blood flow. For your ease, we have researched and highlighted some of the top-selling carpal tunnel gloves available on Amazon. To make it easier for you to understand we have listed down the features of each of the items and customer experiences. The first product on this list are a pair of gloves by Vive. 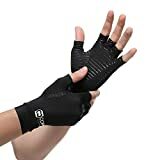 These are high-quality gloves that offer form-fitting and come with a cotton spandex blend that helps take the shape of your hand. This feature is very helpful in compression therapy support. The use of these gloves can help provide relief to pain affected areas such as muscles, tendons and joins as it eradicates stress on the pressure points. Even with the gloves on you will still be able to perform your daily tasks which involve typing, texting or other such activities. The gloves are designed in a way so as to provide a balance between finger and thumb mobility. The product is stitched in a way to reduce any kind of irritation and make sure the user remains comfortable in wearing. These gloves are durable, lightweight and made of breathable material to make it easy to be worn. The gloves allow retention of heat soothing the hands and knuckles. Customers who have used the product have found it to be very effective in providing compression. They have said that the product is effective in dealing with swelling and inflammation. Furthermore, they have said that the product provides a comfortable experience. Tested by experts and designed to provide maximum comfort, these gloves are a must-have for anyone suffering from carpal tunnel syndrome. The product is suitable for use by all and can be used easily. The aim of these gloves is to provide relief, reduce pain along with stiffness caused by arthritis. The designing of the gloves allows for retention of heat and improves circulation thereby reducing pain and promoting healing. Overall the product is lightweight, durable and its breathable qualities will prevent your hands from being stiff. Even with these gloves on you can easily carry out your daily tasks such as typing or texting as they don’t stop you from doing so. 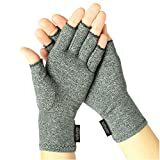 This pair of well-made carpal tunnel gloves will make you feel rejuvenated by allowing to you feel, touch and hold objects without feeling any kind of pain. The company provides a warranty that all its products are free from all kind of manufacturing defects. Customers who have used the product have said that these gloves don’t itch and provide comfort in every way possible. They have said that the product provides an even compression between the fingers and thumb. Customers have appreciated the lightweight of the product as they found it comfortable to wear. These highly recommended carpal tunnel gloves have the highest copper content incorporated. These gloves are perfect for providing warmth to affected areas such as muscles, tendons, and joints. Another plus point of the product is that it allows you to retain your motion range while it works to provide heat. This means that even with the product on you can still carry out your daily activities. The product is designed for patients who have arthritis, carpal tunnel, tendonitis, stiff muscles and more. These gloves can be worn every day and are very comfortable; they can be used by almost everyone. The high-quality material used to make the products doesn’t allow the product to be damaged with every wash. These gloves can also be stretched to make sure maximum compression is provided. Customers who have used the product have stated that these gloves fit perfectly and make you feel great. According to them, they make your old hands feel new again by helping you revive and reducing the pain. The product is effective in dealing with neuropathic pain and can make you feel wonderful without even you noticing that the product is in your hands. These gloves are available in 3 different sizes that are small, medium and large. The purpose of these gloves is to reduce pain that may arise in your hands or wrists. They provide mild compression and give the required support to the thumbs and fingers making them feel new again. The gloves allow you to carry on your daily routine even with them on. They don’t halt you from carrying out tasks such as typing, texting or any other routine based work. With these gloves on you can get your life as they allow you to regain focus and confidence by eradicating pain. You will be able to feel, touch and develop a grip on objects without feeling any kind of pain. Furthermore, the product is easy to use, is comfortable and breathable. The product is designed from a material that prevents sweating and can be washed regularly. The product comes with a money back guarantee thereby providing a guarantee that the product is effective. Customers who have used the product have said that the use of this product has allowed them to carry out routine work without feeling pain. They have labeled it as one of the best gloves available in the market that provides necessary compression. These gloves by Dissupo are designed in a way to strengthen your grip and allow you to touch products easily without feeling pain. With this product, you can easily perform everyday tasks without being disturbed. The compression provided by these gloves allows for greater circulation of blood and also helps in controlling swelling. The product is made using high-quality fabric which is durable and breathable. 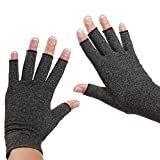 These gloves are perfect for anyone suffering from arthritis, carpal tunnel syndrome, and osteoarthritis. The gloves retain heat and soothe heat and make sure that maximum comfort is provided. They do all this without adding sweat or stuffiness to your hands. For quick recovery, it is recommended that these gloves are worn every day. Customers who have used the product have said that the product is effective in dealing with all kind of pain and provides relief. They have also added that the gloves are lightweight and breathable which makes them perfect for everyday use. Customers with arthritis have especially talked about how they would prefer these gloves over medication. These gloves are definitely worth the investment and a must have for all those who want to cure pain. These popular carpal tunnel gloves provide the most comfortable fit. Made from a cotton elastic material, these gloves can provide compression and improve overall hand movement. The open finger design allows for routine tasks to be carried out without any interference. The gloves are made using lightweight and superior quality soft fabric that can be used for comfort and mobility. These gloves are effective for dealing with conditions such as arthritis, carpal tunnel, muscle stiffness and tendonitis. These gloves are available in a variety of colors. Customers who have used the product have said that not only does it provides comfort but also fits perfectly. Patients with severe hand and wrist pain have stated that these gloves made them feel relieved and provide compression without interfering with the mobility of the fingers. Working women and housewives say that the benefit they get from these gloves is that it allows them to carry out activities without creating any disturbance. Customers with joint pains have talked about their experience with this product and said that it revived them by removing immense pain previously being felt. Further, they added it also helped reduce swelling. While these top selling carpal tunnel gloves can reduce your hand and wrist pain, it is recommended to pair these up with resting your hands frequently. You can also get some help from other products like therapy putty or wrist braces to speed up recovery.